In 1980, a fierce professional rivalry was intensifying between two legends of the tennis world - Sweden’s Björn Borg and America’s John McEnroe. Under the glare of the media’s spotlight, the two sportsmen could not have appeared more different. Borg, the four times Wimbledon champion, seemed icy cool while McEnroe was the foul mouthed and feisty ‘super-brat’. In reality, the pair had far more in common. They shared an almost obsessive passion for tennis - nothing mattered apart from being the best in the world. Both players struggled under the weight of this expectation and failure was not an option. However, there could be only one winner of the 1980 Wimbledon men’s final - an event that would go down in history as one of the greatest tennis matches ever played. Two things gave me pause before watching Janus Metz’s Borg Vs McEnroe. First, Shia LaBeouf’s McEnroe wig looked, well, too wiggy? Second, and perhaps more important, is the film’s claim that it was ‘inspired’ by the true story. While I appreciate the need for dramatic licence (and understand even documentaries can’t present 100% unbiased truth), I do have an uneasy relationship with bio-pics because I want the true story. I dislike coming out of a 'real life' movie only to find that it is largely a work of fiction. It's hard not to feel cheated at moments like these. Couple this with reports of McEnroe’s criticisms of a movie that he just didn’t think was very good (see The Telegraph: John McEnroe: New film makes me look like a jerk - I was but some of the stories they used are made up) and alarm bells started to ring. However, wigs and facts aside, I really enjoyed Borg Vs McEnroe. I found myself gripped by the story that unfolds away from the tennis court. Chances are that you will know who won the historic match (and I won’t spoil it here in case you don’t) but the result is really beside the point. The focus of Metz’s film is the journey, the pressure and how, beneath their perfect rivalry, the two tennis players were more alike than we might think. Metz's film’s title may lead you to believe that Borg Vs McEnroe focuses on both players equally. However, most of the film is devoted to Borg, his home life, his turbulent early career and his relationship with trainer Lennart Bergelin (a powerful and engaging performance from Stellan Skarsgård). It is here that the film’s tension lies - in conveying Borg’s desire to win, his struggle with fame and the tremendous pressure that he was under in the days leading up to the 1980 Wimbledon final. Sverrir Gudnason gives a superb performance as Borg. Not only does he look uncannily like the tennis legend, he also manifests the Swede’s inner conflict. While the film feels rather Borg heavy (McEnroe is given only a few scenes to establish his story), Shia LaBeouf is surprisingly good at bringing his character alive - showing us the demons that both damaged him and drove him to greatness. Borg Vs McEnroe is shot in such a way as to feel authentic to the footage of the time. Interestingly, it does not resort to using archive video of the Wimbledon final. Instead, both LaBeouf and Gudnason trained for months, choreographing the key moments of that remarkable tennis match. I understand Metz’s decision to avoid using actual footage (it could have felt jarring) and I did feel the enormity of every championship point. However, I also think that this part of his film lacks tension and a certain spark of excitement as a result. Overall, I enjoyed Borg Vs McEnroe very much. It works as an interesting bio-pic (making me want to revisit the match and find out more about its central characters) and also an exploration of the pressure and sacrifice that is part and parcel of such sporting excellence. Borg’s son Leo plays Björn aged 9-13. I loved Janus Metz’s 2010 documentary Armadillo. 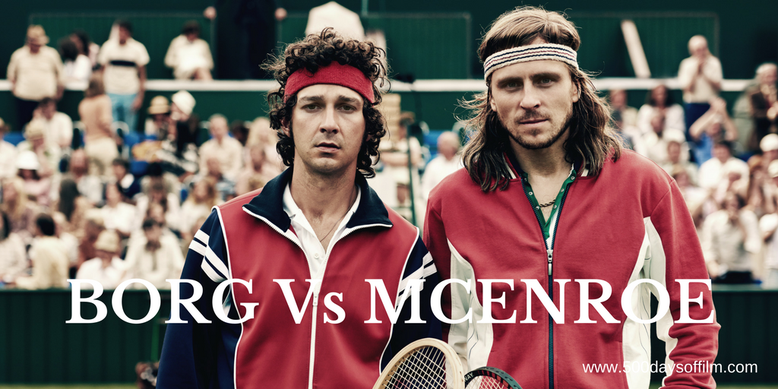 Have you seen Borg Vs McEnroe? If you have, what did you think of Janus Metz’s film? Let me know in the comments below or over on Facebook or Twitter (@500DaysOfFilm).